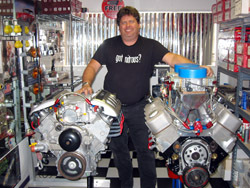 Advanced Automotive was founded in 2003 by local racer and auto technician Robert Williams, a longtime resident of Southwest Florida. Robert discovered high performance cars at a young age and it's been his passion ever since. Growing up reading about the old speed shops of the classic musclecar era, Robert found very few examples of the kind of "one stop performance shops" that actually had relationships with their customers, rather than simply being order takers. Today, the performance industry is dominated by large mailorder firms that are in large part faceless and only know who their customers are by number. Coupled with Internet-only "shops" (a great deal of which are just websites run part time by people with a laptop in the bedroom), the need for the shop you could stop by and get straightforward advice, quality parts and workmanship was dire. At car shows.. at the races... Robert kept hearing the same thing from people: "What we need is an old school speed shop, like the ones I remembered from back in..."
Seeing a need, Robert set out to bring the concept of the old school speed shop back. Blending "old school" ethics with modern performance techniques, the result was: Southwest Florida's Full Service Speed Shop. There are a lot of people out there who claim they can "restore" a car, or "make it run fast", or even "fix it right". You run across them everywhere, from cruise-ins to car shows, from the local corner garage to the Internet forums. Unfortunately, these self-proclaimed "experts" are a fact of life in the high-performance community. Consequently, a lot of these very same people have no Earthly idea what they’re getting into when they agree to do the job they claim they can do. The end result is often an unhappy client or worse... a torn down, unfinished project vehicle that no-one will touch, and the client's hard earned money has disappeared. If they're lucky, any parts they paid for will be in boxes thrown in the vehicle, but more often than not, those expensive parts have disappeared too! We see and hear this story all too often, unfortunately. Or.. a client may have gotten an idea about the real cost of a major project, and one of these "experts" will offer a "good buddy deal" to "save money", cutting corners and/or using inferior parts and services (often without the client's knowledge) to build a car that's "just as good, but cheaper". If you hear the words "as good as", or "just as good" in the conversation when it comes to comparing quality ... well, you’ll get what you paid for and no more. We here at Advanced Automotive feel differently about this. For one, we don’t try to dazzle you with a flashy web site and nothing else, nor are we doing this as a secondary hobby. We've been in the high performance community for over 30 years and counting. With our experience, both in high-performance and racing, we use the knowledge gained to make your hot street car a bit hotter, your race car faster, or your show car a bit "tricker". We must be doing something right, as we’ve won NHRA Wally and Best of Show awards. As a matter of fact, some of our competitors actually come to us for technical assistance, and for parts and service! Proof indeed that the Advanced Automotive way of thinking works. A wise man once said: "The bitterness of poor quality remains long after the sweetness of low price is forgotten.." You won’t have that regret when you deal with Advanced Automotive. Ask any of our satisfied clients, we didn't get here by accident. Take a look around our site, and if you still have any doubts about our ability, please give us a call or drop us an e-mail. We'll be happy to answer any questions you may have about our work, or our products. Better yet.. come by our shop and see for yourself! Our shop and retail store is conveniently located next to A1 Shelters on SE 10th Street, in the Mid-Cape Industrial Park, directly off Del Prado Boulevard. To find your way to us, take a look at the map and directions below. 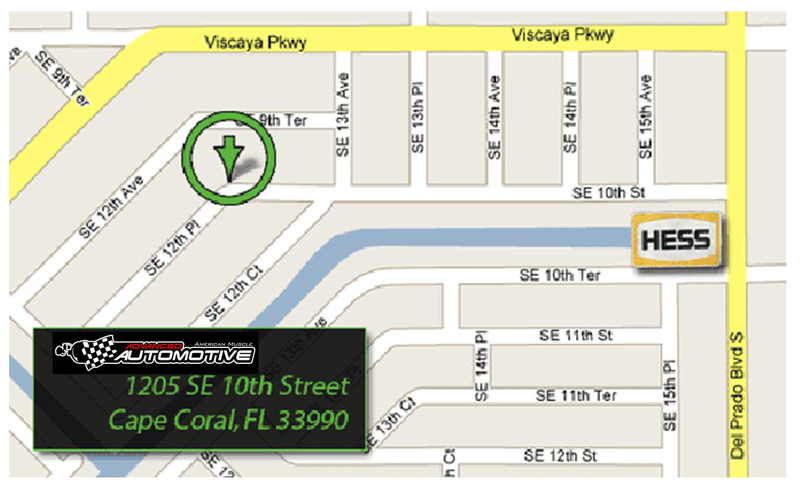 Take Del Prado Boulvard south, past Cape Coral Hospital, and past the traffic signal at Viscaya Parkway. Turn right at the Hess station onto SE 10th Street. Drive west on SE 10th Street until the road turns to the left. We'll be on the right-hand side of the road. Take Del Prado northbound. Approximately 1 mile north of Wal-Mart (after two traffic signals), turn left onto SE 10th Street with the Hess station on your left (directly across from the Downtowner Car Wash and Burger King on your right). Drive west on SE 10th Street until the road turns to the left. We'll be on the right-hand side of the road. To contact us by email with any questions you may have, Click Here.